Recently, I've had an obsession with Jodi Picoult's books so be expecting a lot of reviews on books by her! I was hooked from the very beginning with this book; As soon as it started I was shocked and just wanted to read on! I ended up starting this book on Saturday and finishing it on the Wednesday. A little while after this cliffhanger there was another one and, once again, I was left feeling so surprised because they were so unexpected! I really enjoyed this aspect because it kept me wanting to read on. Another thing I loved about this book was that each chapter was written by a different character in the book. This meant I got to see what the other characters were thinking and what they thought about actions caused by other characters. It also meant I could see how each character was feeling at that time. I think all of Jodi's books are written in this format but that doesn't matter because it just makes the characters more relatable. I also enjoyed the wolf aspect running throughout this book. I was actually surprised at how much I didn't know about wolves and this book turned out to be very informative. I think the wolf was a really nice touch to the book! I loved how a family that was once torn apart by one man, are brought together by the same man. That is some good writing if you ask me! 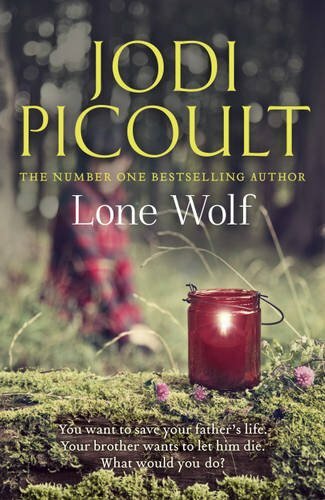 Lone Wolf was very thought provoking because it made me think about what I would do if I were in a situation like this... I actually had to question my mum about who was the person to make decisions like this and what she would want me to do if she was unconscious because up until reading this book I had no idea. My favourite character was definitely Cara because I felt like I could relate to her and the way she felt. She had to make a lot of hard decisions in this book and it just showed how strong she really was even though she didn't believe it herself. Anyway I definitely recommend this book! It's a nice, easy read that informs you of realistic events. It includes the troubles of family problems and it certainly made me think about situations like this because they could happen to anyone! There were scenes of anger and love and care and it was another successful book from Jodi. Scars are just a treasure map for pain you've buried too deep to remember. This is what I like about photographs. They're proof that once, even if just for for a heartbeat, everything was perfect. LOL I also nominated you! So you have been twice nominated! Really?! I would recommend any of her books, they're all amazing! Her books are all about realistic scenarios and they're just nice, contemporary reads. What I love is that she always puts a twist on the last two pages or something at the end and it's just so unexpected! I'm reading Handle With Care at the moment so that review will be up shortly :) Make sure to look out for it!